(15Nov08)This issue will take another look at polytarp sails. The 1December issue will take a look at what happens when the weight goes up. Dave McGuire launches his new AF3 in Vermont foliage and remembered to lower that leeboard after the photo was taken. 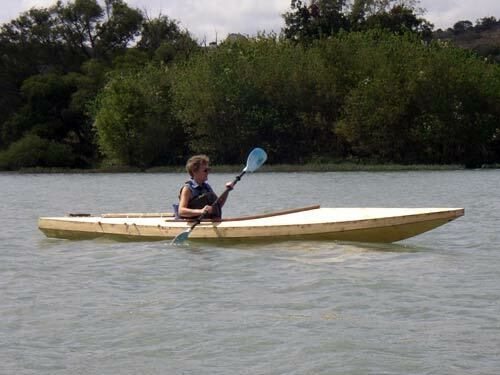 "I've attached a tarp-sailed boat photo. This was taken by my friend Nick Burningham in Australia, who's an expert on Indonesian working craft. 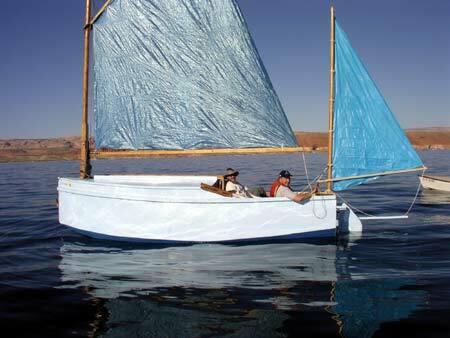 He says tarp sails are the standard on Indonesian sailboats now. He explains they are sewn in double thickness "like bricks" so the seams overlap. No shape. Just sewn up and hoisted." 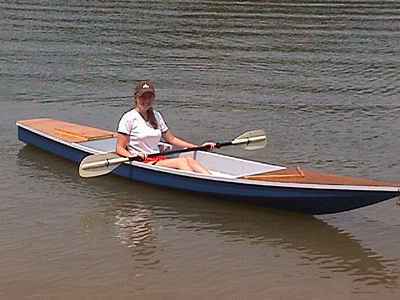 Well, you can see there are lots of ways to make a sail and some folks have figured out how to use the cheap material on a large boat. Break out the sewing machine. Any sewing machine will sew polytarp although you should use one that will sew a zigzag stitch. Use a rot proof thread like V69 polyester the SailRite sells. Practice a bit if you aren't used to sewing. Read the manual if you've got one. Next open the fold and pull the cloth tight across the seam. It won't be flat anymore but that's the whole point of the special seams. There will be a little flap of material stcking out. Fold it flat and sew down the loose edge with a zigzag stitch. Then sew over the other edge of the flap, that is the edge with the straight stitch, with the zigzag stitch to further secure it. The luff hem needs a stiffer and stronger treatment. I've been using 3" wide fiberglass tape, the same stuff used to make taped seam plywood hulls. It's fairly inexpensive and very easy to sew. It's edges are treated to prevent unraveling. Dacron sailmaker's tape would also be ideal. Here is how I do the job with fiberglass. I ust sew a 3" wide tape down each side of the luff. The ends, which will unravel badly if left raw, are doubled under the last 6" or sew before being sewn down. That prevents unraveling and also provides a second layer of material in the region of the end grommets, the most highly loaded grommets in the system. It might be advised to sew a final protective layer of tarp over the top of the glass tapes as the tapes seem to abrade easily with handling. All the luff sewing is with zigzag. The Toto shape worked so well that I used it in other designs like Roar2 and RB42. 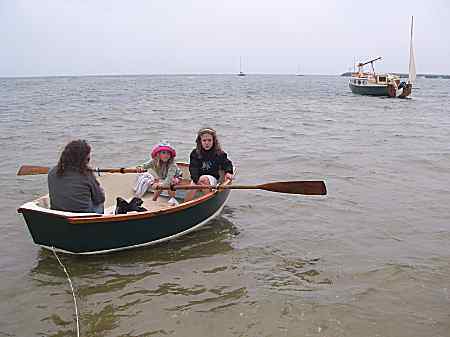 I tried it also in a sailing boat, the 20' Frolic2 (the original Frolic was narrower, more of a rowboat than a sailboat). 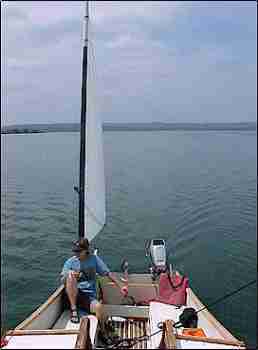 Frolic2 was unballasted with a small cuddy and I hoped it would be a good daysailer and one man camping boat. 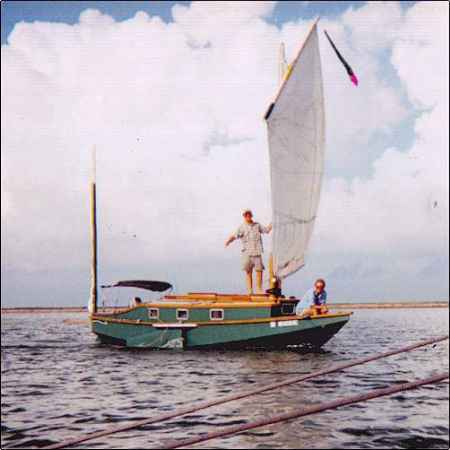 Bill Moffitt had built my Woobo design and funded a 20% enlargement of Frolic2 that would have a cabin, water ballast, and a yawl rig for cruising near the Gulf Coast. The 20% enlargement idea went very well except that I had to deepen the hull more than that to give some serious headroom in the cabin, but it doesn't have standing headroom. Great empasis was placed on ease of use and rigging. The main mast is short and stepped in a tabernacle. There is a draining anchor well in the bow, a small storage segment under the front deck. The mast tabernacle is bolted to the bulkhead that forms the front of the sleeping cabin. There is a utility room aft of the sleeping room. Water ballast tanks are under the bunks and in the sides of the utility room floor, about 600 pounds of ballast as I recall. Aft of the cabin is the self draining raised cockpit with storage volume under the deck. Finally there is a self draining motor well across the stern. Construction is taped seam plywood. Bill couldn't start his Caprice right away but Chuck Leinweber of Duckworksmagazine gave it a try. He has the room and tools and smarts to tackle a project like this with no hesitation. There weren't many changes from the plans that I know of, the main one being adding a conventional footwell to the aft deck which is designed to have a hatch type of foot well as with the Bolger Micro. Chuck trailered his Caprice up from Texas to our Midwest Messabout this June and I had a chance to go over it, sail it for a couple of hours, and watch it sail from other boats. Wonderful! 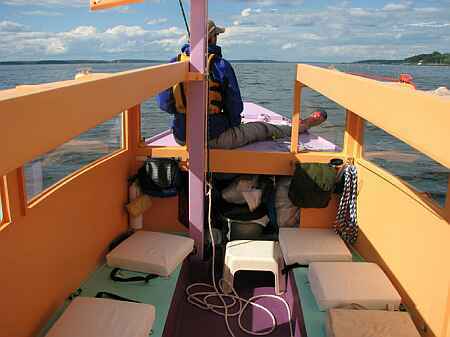 Chuck tells me it takes less than 15 minutes to rig the boat to as you see here. 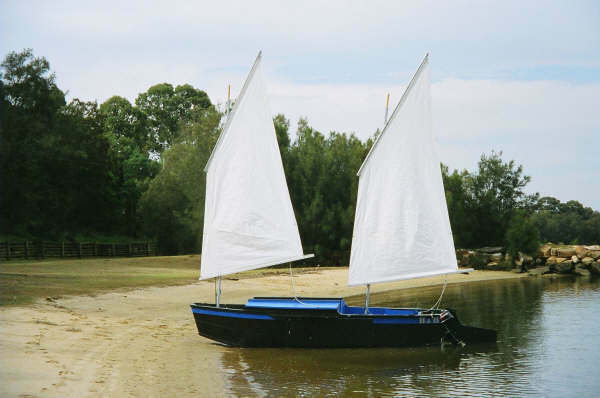 As shown the boat has its ballast so you see it beaches very well indeed. I asked about the ballast. He can flood the tanks without power, just open the access plate, reach in and pull the fill plug and let the water rush in. Since the tops of the tanks are about even with the normal waterline he has to move his weight around to keep the tank depressed long enough to completely fill. Then you reach into the filled tank, replace the plug in the bottom, and then replace the access plate in the top. There are two tanks to fill. Are the ballast tanks worth the building effort? On a multichine hull like this the tops of the tanks form flats that give places for bunks and storage so that is good. When full the boat should have a very good range of stabiltiy. Chuck's boat has never been in rough going as I'm writing this so the effect of the ballast remains to be proven. 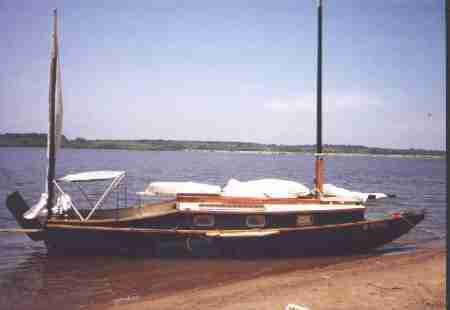 It has been capsized in a practice but the ballast tanks were empty and the boat was empty with no crew, etc.. But the ballast is a success from the standpoint that Chuck is able to tow his Caprice behind a four cylinder pickup truck. My idea was to pull the boat up the ramp and drain the tanks afterward by simply pulling the drains plugs. 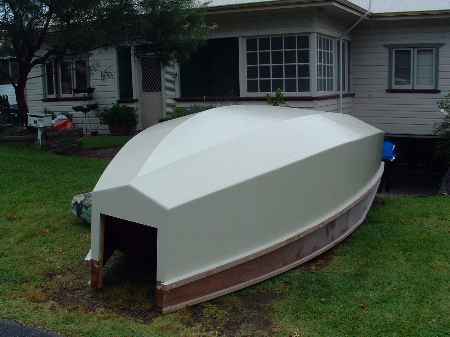 But Chuck has found it best by far to empty the tanks before recovering the boat at the ramp. So he uses a bilge pump in each tank to pump them empty. I'd be worried about water ballast tanks on a wooden boat from a rot standpoint and would be careful to open all the plugs and access panels when the boat is stored. Caprice has the tabernacle setup that I first saw on Karl James' sharpie. 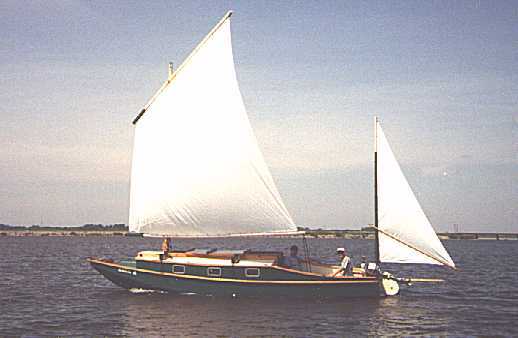 The mainsail is 190 square feet, balanced lug. 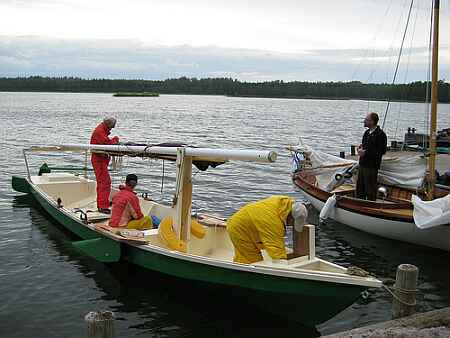 The mast is fairly short, stowing within the length of the boat when lowered. Chuck demonstrated putting up the mast, maybe a 15 second operation. 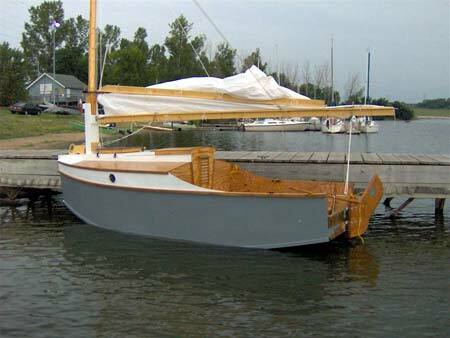 I've been drawing these for a while on different boats but this is the first one I know of to get built and used. I'm greatly relieved that is all works so well. Before you decide to tack a tabernacle like this onto your boat, be advised that the tabernacle posts go clear to the hull bottom with big bolts all around a beefy bulkhead. 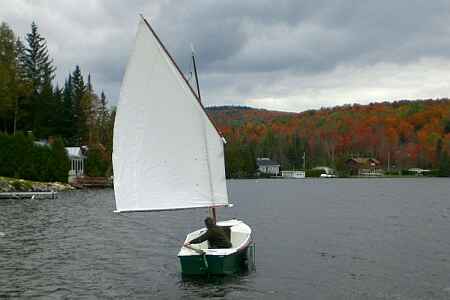 I thought Caprice sailed very well in the light winds we had that weekend. Tacked very smoothly through 90 to 100 degrees which is all you can ever get with a low tech rig. Very smooth and quiet compared to the sharpies I'm used to. It didn't seem at all sensitive to fore-aft trim. In the light winds it went 5 knots on the GPS which is certainly fast for the conditions. Well, all in all I thought Caprice was everything I was hoping for.. Plans are $45. And the Raider of Norm Wolfe did indeed make it to the Finnish Raid. I'll bet the paint was still wet.